For those of you who’ve never heard of using Monistat Chafing Gel as a face primer, don’t go running for the hills at the thought of putting something from Monistat on your face! If you like silicone-based primers like Smashbox’s Photo Finish Foundation Primer, this is a great option for you at a fraction of the price. It even contains the same active ingredient, Dimethicone. A little blob is all you need to cover your entire face. The Good: As silicone-based primers go, this is definitely one of the best. It smooths on beautifully, gives your complexion a smooth as silk finish, and helps to keep you matte all day. Plus it’s cheap cheap cheap and comes in a handy, easy to travel-with squeeze tube! This did a better job at keeping me matte than the Smashbox did, and at about 1/5 of the price it’s definitely worth it. The Bad: Like any other silicone-based primer, this may clog your pores and therefore cause breakouts if you’re not good about thoroughly cleansing at the end of every day. The Ugly: Yes you’ll need to go to your local drugstore, walk down the “feminine care” aisle and pick up a Monistat product. But is it really any worse than going on a tampon run? I think not! So muster up that courage and go try this out! Now for my little DIY installment: My favorite way to use my Monistant Chafing Gel is mixed in with my foundation of choice to create a siliconey foundation ala By Terry’s Light-Expert, Armani’s Face Fabric, etc. The consistency is heavenly, and your foundation will glide on with zero drag against your skin–you really need to try this! Step 1: Squirt a little blob of the Monistant Chafing Gel onto the back of your hand. Step 2: Add some foundation and luminizer (I had a small pump of my Beauty Credit Pearl Shine) on top of the Monistat. Step 3: Mix everything together and apply to your face. See how the thin foundation from above now has that wonderful soft and plush silicone texture to it? And in three easy steps you’ve got a foundation that not only feels amazing going on, but also absorbs oils and helps to keep you matte and fresh-faced all day! 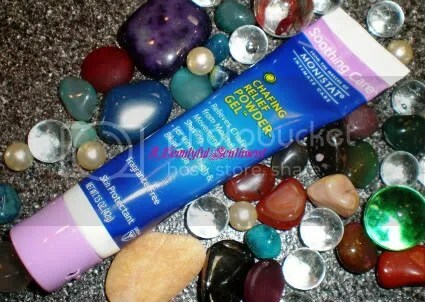 Check out my review of Beauty Credit’s Q10 Pearl Shine Make Up Base for a great and affordable luminizing primer. Click on the word “primer” below to check out my other primer reviews!